The weather during this time of the year is never anything short of bi-polar. Any day you can wake up with it being 35 degrees and it will hit 65-70 degrees by 3pm, then drop down to 45 degrees by nightfall. As a woman this makes dressing fashionably, and practically, nearly impossible. Yesterday my newest issue of Vogue arrived and it is there, as well as random sightings, that I have found some inspiration for some pieces to make the transition to Spring a little easier. 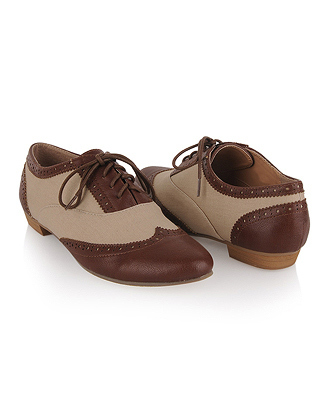 I’ve always loved the practicality and the classic nostalgia that Oxford shoes represent. In the fall I purchased some suede/patent leather black heeled ones that won’t transition well to Spring. These two-toned brown ones will get the job done and can match many different looks. 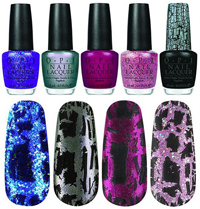 OPI has been my primary polish brand of choice ever since Veronika introduced the brand to me (she is to nails what I am to hair). At the beginning of this year the brand’s newest line, Shatter, was introduced. Veronika got me a bottle of the black color and I can’t wait to pair it with a shade of red. Over the past few weeks, I’ve been seeing this look repeated quite often. I love it! The tights protect you from the cold temperatures while the shorts reflect the warmer weather. I would like to try this look with tweed shorts/basic black tights or some basic dark shorts/patterned black tights. I’ve seen a few women wear colored tights such as red or fuschia but I’m not a fan of it-that look is a bit too loud for my own personal taste. Military-inspired trenches and coats aren’t too new to the fashion scene, but what is new is the incorporation of feminine-detailing, such as the ruffles you see on this coat. I also like how it’s featured in the peach shade. I am a fan of all things ruffly, pearl-adorned and feminine so this look is right up my alley! Color is your friend! 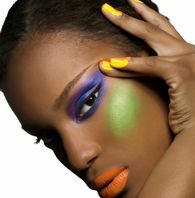 Too often, women of color shy away from bright tones in the makeup aisle because we are afraid we won’t apply it correctly and will wind up looking like a clown. Those concerns are valid; I myself have subscribed to them. Recently however, I attempted red lipstick and successfully pulled it off. I recommend visiting a MAC counter or taking a trip to Sephora and having makeup pros find bright tones that are flattering for your skin tone and have them TEACH you how to properly apply it. As long as you have that guidance (along with YouTube makeup tutorials) you should be okay. Still in doubt? Make sure you have a true friend or two nearby to give you honest feedback as to whether the specific color you’re trying is working out for your best interest.